Black is singer and songwriter Colin Vearncombe. Released in 1987, 'Wonderful life' is best known for the title track which reached number 8 in the singles charts and stayed in the charts for 9 weeks - indeed it's a song you still hear on TV or radio now. A second single, 'Sweetest smile' had similar success - spending ten weeks in the charts and reaching number 8. The album had great success reaching number 3 in the album charts and selling well over 1.5 million copies. This deluxe edition includes the original album on one CD plus a second CD containing 14 bonus tracks, including the original Ugly Man version of the Wonderful Life single plus a selection of B-sides and four songs from a 1986 Janice Long session. The album’s liner notes come complete with a specially commissioned interview with Colin. The release of the deluxe edition of the album is timed to coincide with his UK tour in April. Many people will dismiss Black as a one-hit wonder simply because they only know one of his songs, but 2 top ten singles make him a bit more than that. Admittedly though, nothing he's released since has had anything like the success of 'Wonderful life'. So what's the album like? Well the title track is definitely the biggest highlight of the album by far - it's an all-time classic song in my view. The rest of the album is good too - 'Sweetest smile' in particular is very good, but whereas the title track would score 10 out of 10, the rest of the songs are more like a 7 or 8 out of 10. Normally that would be great, but it just suffers slightly as great songs seem less great when compared to an outstanding track, and that's the problem here - nothing else lives up to 'Wonderful life'. 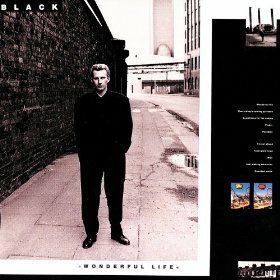 If you're a fan of Black or of 80s pop then this is a great album particularly with the extras on the second disc, but if you're expecting an album full of songs as good as 'Wonderful life' then you may feel disappointed initially, but if you give it a chance then you'll find its actually a very good album. 'Wonderful life (Deluxe edition)' is out now.